Cats have good reasons for sleeping curled up in a ball. 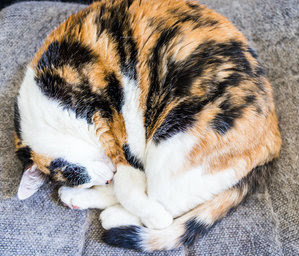 Why do cats sleep curled up in a ball? Isn't that uncomfortable? Don't worry. Your cat's fine sleeping curled up in a ball. And when she starts to feel uncomfortable, she can always stretch out! I lived outside for a long time before I moved in here, so I guess I'm a defensive sleeper. I feel warm and safe sleeping curled up in a ball with my very fluffy tail covering my eyes. Believe it or not, my favorite place to sleep is a round sink. It's just the right shape and size. Our body temperatures are lower than yours, and we're always a bit chilly when we're inside. Sleeping curled up in a ball keeps us warm and helps us preserve body heat. It also keeps us safe. Think of it as defensive sleeping. 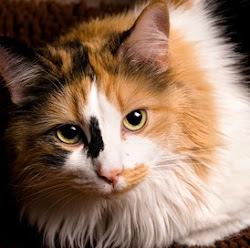 When your cat is curled up in a ball, the vital organs in her stomach are covered and protected. While sleeping stretched out might be more comfortable (I don't really know because I don't do it), curling up in a ball isn't uncomfortable because our backs are so flexible. Personally, I like sleeping on hard surfaces and love my sink. But your cat might like a smallish round cat bed. Belle and Honey Cat love their round doughnut beds because, like my sink, they're the right size and shape. Labels: Cat Behavior, Cats And Sleep, Why Do Cats Sleep Curled Up?